For the first time, the surprising recent works of Dutch artist Ger van Elk are on view in Germany - at Galerie m Bochum. His "moving images" can no longer be classified under the traditional categories of film, photography, painting or drawing, but have something to do with all of them. In their formal aspects, a picture surface with matte and frame, van Elk's works appear to meet our expectations of what a classic painting should look like. Upon closer observation, however, we are perplexed to discover that we are by no means looking at a static painting, but rather at structures and motifs that are moving and shifting over one another, so that time, movement and narrative sequence all form a part of the picture. Despite the precise, ostensibly anonymous technique used to create his digital images, Ger van Elk discovers in this medium an extremely poetic and graceful pictorial language. In the movement of the images he is able to express a kind of stillness, moments of lingering and of contemplation. He skilfully quotes works from the history of art and sets their formal language into motion in order to create moments of astounding fascination. Just as impressive are his metaphors for existential experiences, which strike chords within us, evoking memories or associations. It is as if he were translating poems into moving images, narrating them cinematically. 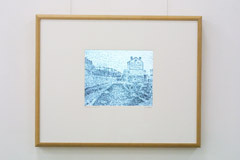 In “Adieu à K.“ for example, the delicate profile of a woman appears like a breath in a mirror, superimposed over a train going by in the distance. The observer looking 'in the mirror' seems to be left behind on the platform, which immediately calls up memories of departures, the pain that was felt and the grief of the moment. The way in which Ger van Elk assimilates the latest technical image editing possibilities and makes them his own, combining them with the classical artistic techniques of painting, drawing, photography or film, is something completely new and as yet not seen anywhere else. In “Birds flying the drawing“ a pointillist drawing originally by Signac forms itself out of a flock of birds flying across the picture surface. It seems as if the many black points making up the original drawing have come to life. We are enthralled as Ger van Elk lets us listen in on the conversation between his “Talking trees“, which, swaying in the wind, converse animatedly with one another, although silent. 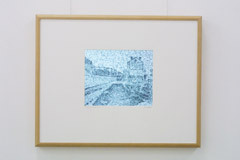 These latest works by Ger van Elk exert an irresistible fascination on the observer. The way in which the artist translates cutting-edge digital imaging techniques into enchanting lyric imagery makes viewing these works a unique experience.